Another local welfare program is the maintenance of children’s homes for Jewish youngsters from at-risk home situations. The separate boys’ and girls’ residences accommodate a total of 36 youngsters between the ages of seven and 17, said Rabbi Vishedski. All attend the Jewish day school. Chabad organized community seders this year in six different halls. Participants purchased tickets available at three different prices, representing different levels of service. The graded seders are evidence of a new level of responsibility in the Jewish community, said Rabbi Vishedski; individuals are beginning to see themselves as partners with the organized community, acknowledging that they must work with the official community to provide services and not expect the official infrastructure to do everything for them. He believes that the current economic crisis has encouraged people to think in terms of community. 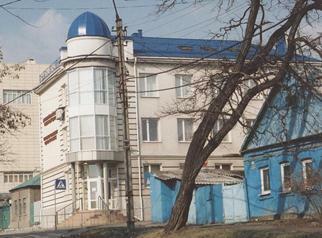 The Donetsk Chabad infrastructure is one of the leading producers of kosher food in Ukraine. Two rabbis work exclusively in this domain, said Rabbi Vishedski, inspecting farms and factories and otherwise supervising kosher certification. Local enterprises produce kosher meat, poultry, wine, cereals, dairy products, and chocolates, he said. Importing of foreign kosher food continues, Rabbi Vishedski stated, but imported kosher products often cost as much as 20 times more than local non-kosher food. Locally-produced kosher food also is more expensive than non-kosher food, he said, but the price differentiation is much less. Speaking more generally, Rabbi Vishedski estimated the Donetsk Jewish population at about 15,000 people, many of whom remain distant from Jewish life. Rabbi Vishedski said that he and his colleagues have a great deal of work to do in reaching out to those who have not yet come forward. The synagogue is approached fairly frequently, he noted, by individuals who believe they have some Jewish ancestry and would like assistance in confirming their Jewish heritage. Many such people, Rabbi Vishedski observed, are contemplating aliyah and need proof of Jewish background in order to obtain an Israeli visa; he and his colleagues are very pleased to help such individuals find the records that they need, Rabbi Vishedski noted. In response to a question, Rabbi Vishedski said that the economic situation in the city was “not good”. People have little confidence in the future, he stated, and, therefore, very little investment occurs. Some small businesses seem to be successful, he noted, but big business is “dead”. Unemployment probably is about 15 percent. When unemployed Jews approach him for help in obtaining work, Rabbi Vishedski stated, he often asks local Jewish businessmen if they can provide jobs. He also asks Jewish store owners to give discounts to needy Jews. Continuing inflation also is a problem throughout Ukraine, said Rabbi Vishedski, attributing it to the weak American dollar. Responding to another question, Rabbi Vishedski stated that antisemitism is not a major issue. Occasionally, some antisemitic hooliganism occurs, such as antisemitic graffiti, but such acts are rare. One doesn’t feel antisemitism in the general atmosphere, he commented. 48. A major accomplishment of Rabbi Vishedski is the opening of a Chabad Jewish community center in 2005. Located diagonally across the street from the current synagogue, the JCC includes a number of class and activity rooms, a fitness room, a large library, a computer room with eight workstations, and a community hall. Ac-cording to Tamara Zeitlina, the JCC director, up to 400 people use its facil-ities every week. The blue-domed Chabad JCC is a short walk across the street from the Chabad synagogue. The JCC offers classes in Hebrew, English, and Jewish tradition. It hosts a veterans club and other activities for Jewish seniors. It sponsors a youth club and classes for preschool children and their caregivers. A small museum-caliber display of local Jewish history is on view in an ensemble of glass cases outside the library. The library is so extensive and provides such a pleasant working atmosphere that it is visited by Jews and non-Jews alike, said Ms. Zeitlin. 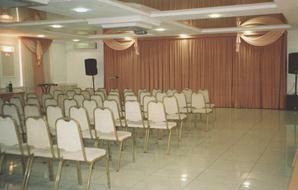 The community hall is used for conferences, concerts, and weddings. It seats 250 in a theater setting, 140 when people are seated at tables. The stage curtain (see photo on facing page) is a prop; the facility does not include a stage. The fitness hall is a gift from Rinat Akhmetov, a Donetsk oligarch who is the wealthiest individual in Ukraine with a net worth estimated by some at $16 billion. His major financial interests are in coal mines and the steel industry. He also owns the leading Donetsk professional football team. Mr. Akhmetov is a Moslem of Tatar origin. 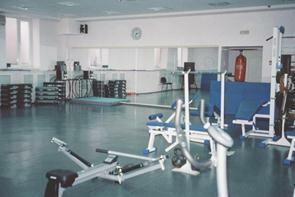 The photos above show the community hall and the fitness room in the Donetsk Chabad Jewish community center. Photos: the writer. 49. The Masorti (Conservative) movement has maintained a small presence in Donetsk, led by Aleksandr Ivashenko, a local individual who teaches Jewish studies and Hebrew language at a local university, since 2005. Mr. Ivashenko is a lead teacher in the Hebrew ulpan operated by the Jewish Agency for Israel as well. With financial support from Masorti Olami (World Council of Masorti/Conservative Synagogues), the Masorti movement rents several classrooms and the library at a centrally-located Donetsk public school for its programs, most of which take place on Sundays. A Sunday school attracts about 30 youngsters between the ages of 10 and 17, as well as their parents; the curriculum includes Hebrew, Jewish tradition, Jewish dance, and Jewish cooking (both Ashkenazi and Sephardi). A chapter of the Marom student group has about 30 members, said Mr. Ivashenko. About 60 people attend most Masorti holiday celebrations, he noted. At the time that the community center was first contemplated, Rabbi Vishedski was approached by the American Jewish Joint Distribution Committee, which offered a substantial contribution to the project in return for JDC naming rights to the building and transfer of legal title to the building to JDC. The local Chabad philanthropic board rejected the take-over proposal. See http://www.forbes.com/profile/rinat-akhmetov. Retrieved May 20, 2011. The impetus for establishing a formal Masorti presence and educational program in Donetsk was a visit to the city by Gila Katz, who occupies a senior position in Midreshet Yerushalayim, the Russian-language outreach program of the Schechter Institute of Jerusalem. Ms. Katz contacted Mr. Ivashenko who was thought to be interested in Masorti Judaism.